Perhaps the Belfast Harbour Commissioners don’t yet realise the significance of what they’ve created on Sydenham Road. In a sense their separate cycle path (arguably the best stretch in the city) is an interesting symbol of the changing nature of Belfast’s Harbour Estate. The area is moving further away from the days of heavy industry to a clever future mix of innovation, education, high skilled jobs with big inward investors, start-up hubs, urban sport parks, education campuses, signature tourism and leisure facilities. With a new resident population growing in hi-spec apartment space, and commuter traffic growing, the area needs a smart, modern transport mix to thrive. The path was constructed in spring 2013, part of better defined road space. Two extremely wide lanes were split into 4 with the additional space used to create a wide 2-way cycle path, fully kerb separated. Although general traffic capacity was technically doubled, this was still a remarkable example of taking road space away from motor vehicles for cycling – on private land as well. Who better to get on with the relatively insignificant job of road space reallocation than the Belfast Harbour Commissioners. This organisation, and their forebears, moved heaven and (literally) earth to create and shape a great port city from the sandy shallows of a lough which used to be named after Carrickfergus, the former primary settlement. Belfast Harbour sits at the junction of 4 great cycling routes – the Lagan Towpath, Loughshore Path, Comber Greenway and Connswater Greenway. With the new Sam Thompson Bridge sited within the Harbour Estate and the ongoing positive reception for the Connswater project, Belfast Harbour is now a key link in Belfast’s active travel chain. Yet, the Sydenham Road cycle path is in danger of being the Harbour’s high-water mark, as current expansion work and outstanding issues mean the quality of the route is beginning to recede. So what are the problems and potential solutions to the Sydenham Road route? Rumours of works to the Sydenham Road route drew me down to the area in May, and it was disappointing to see a shared footpath solution being constructed at the Dee Street roundabout. From excellent separate #space4cycling to an awful compromise within metres. 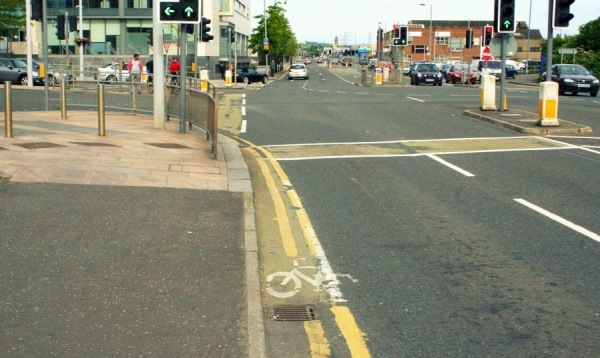 This is the classic approach to cycle design in Belfast; a cycle lane (and a magnificent one in this case) built where space is easy to take from general traffic, but at major junctions cycling space must disappear to meet the needs of motor vehicles. More worrying is the lack of thought about the curve to access the new crossing to Airport Road. After passing a prominent electricity box, a high brick wall obscures the view on a turn which greater than 90 degrees. Faster bicycle traffic will mix with pedestrians here, and the potential for collisions at peak times is now very high. 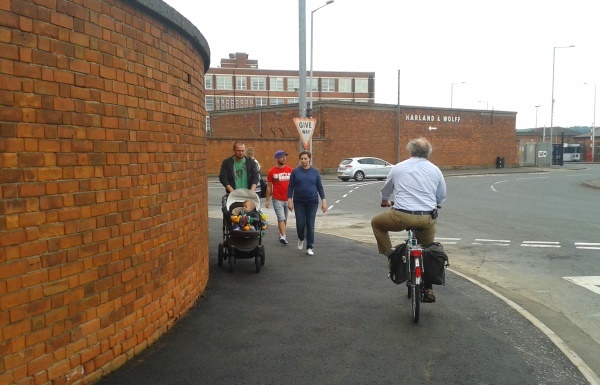 As nice as the brick wall is, Belfast Harbour could remove it to create more space for dedicated separated cycling and walking space on this roundabout. 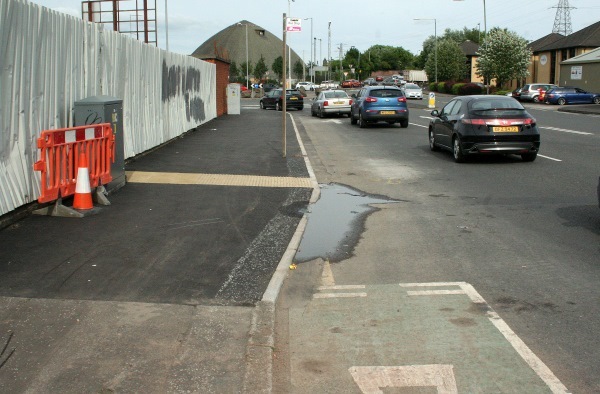 (Update 26 Jun 14 – reliably informed this wall belongs to a tenant company, so “..Belfast Harbour could approach them to remove it..”) Alternatively, a three-lane roundabout can afford to have enough space clipped off to provide a more continuous cycle route – plenty of examples of best practice exist in the Netherlands. Smarter investment in altering the roundabout design would also go some way to solving the maddening problem of citybound access to the cycle path from Dee Street and the Sydenham Bypass. If you’re confident enough to have crossed a double roundabout (with very heavy traffic) you have to get from one side of a fast and noisy 4 lane carriageway to the other. It’s utterly impractical and quite dangerous (even when dismounting and trying to walk) for families or inexperience cyclists. Belfast Harbour had a great chance to make a vast improvement on the Odyssey to Victoria Park route; instead the Dee Street roundabout area remains its weakest link. A big favourite with patrons of the Belfast Cycling Study Tour, the ramps on the cycle path made little sense, especially given the harsh angles which lead many people to use the road instead. Even at low speed, these provide a hefty jolt to bicycle and rider. Following complaints, Belfast Harbour (to their credit) have altered the approaches on the ‘bus stop ramp’ to allow a smooth transit. Yet, strangely, the final ramp near the Dee Street roundabout remains in its original spoke-snapping shape. 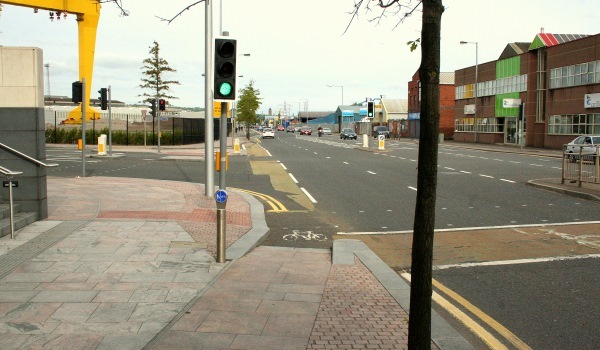 Unlike the central ramp, which serves a pedestrian crossing to Titanic Quarter train station, the purpose here seems only to access to a bin and post box. The balance of inconveniences seem badly skewed against dozens of everyday users. This final problem ramp needs to either be removed completely or the approaches flattened as above. While the main separate cycle path is (bar a few minor bumps) a joy, the Odyssey to Victoria Park route is neither consistent nor continuous – the mark of great cycling infrastructure around the world. If you have to think too much about where you can or can’t be; if signage isn’t clear; if you have to take difficult and seemingly unnecessary diversions; if you inconvenience people, you are not encouraging the use of bicycles. 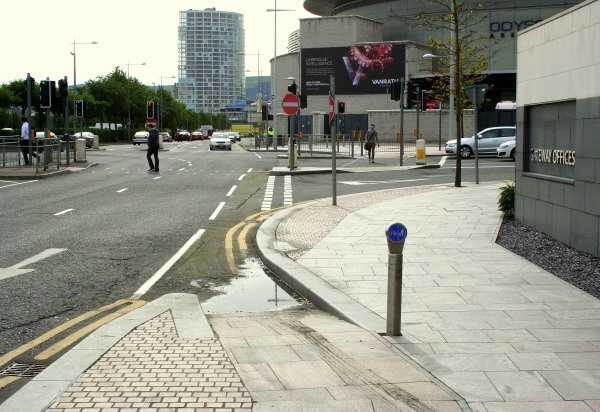 From the Odyssey, you either start on the footway or on the road – there is no dedicated cycling space. At the Queens Road junction you’ll meet this generously wide cycle lane. Held for an eternity at the traffic lights (sustainable transport journeys really need to have some advantage over motor traffic) you move across an advisory cycle lane and up a ramp onto a shared footway. Not too bad, except coming back the other way the visual queue is to cycle against the traffic – lethal if not illegal? At the next junction is a similar ramp, with more confusion – cycling down the ramp onto the road doesn’t seem to be affected by the adjacent signal-controlled junction. While many would feel it’s prudent to wait, there’s nothing to caution users that cycling down into the junction is potentially dangerous – leaving a real threat of collision. Where would the responsibility lie? Do you stop at a red light? Who has priority if you proceed? The right hand side of the picture above says it all. If you’ve designed a dedicated route for cycling, and you feel that the road beside still needs an advanced stop line for bicycles, your design has failed. Not only do users have to contend with several transitions between shared and dedicated space, but those transitions themselves suffer from poor implementation. A lack of drainage is causing ‘perma-puddles’ to build up. As an occasional inconvenience perhaps not too bad, but the water sits for weeks at a time (even through dry spells, as in the picture) leading to murky, muddy pools gathering dirt and moss. People commuting to work risk getting clothes dirty, and chances of slips and falls are increased. Bad enough that one perma-puddle exists, but given that a new transition has just been created, lessons clearly haven’t been learnt. Hopefully this solves the drainage problems, and shows that Belfast Harbour are sensitive to the issues on this cycle route. 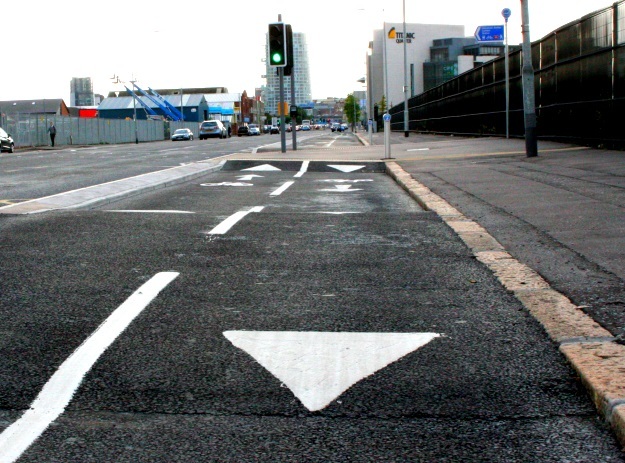 Belfast Harbour is now firmly in the business of cycle route planning and design. If they deliver cycle space of a poor standard, it reflects badly on the neighbouring routes at Laganside and the Connswater Greenway, dragging down their potential too. Over the long decades, generations of Harbour Commissioners and the industries and trade they’ve fostered have done things on a grand scale – city building, airplane manufacture, Hollywood film production, launching the most famous ocean liners in the world. While NI hopes that DRD’s new Cycling Unit is learning from cycling infrastructure best practice around the world, the industry and output from Belfast Harbour has always sought to be world-leading. Why should the Harbour’s cycle space be any different? I do not understand the cycle provision on the Sydenham Road. Imagine the carnage if road design was that bad. @nigreenways @niroads @StripyMoggie Cycling city bound on that cycle lane, where are you meant to go when it runs out ? 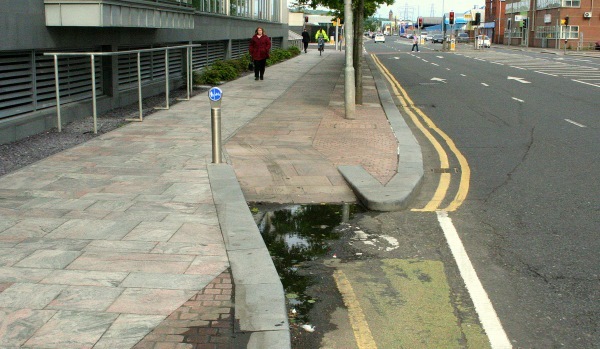 @fattakin @nigreenways me either- I ended up accessing it further up at the first place with lowered kerb access.